Hansgrohe manages to capture the attention of customers due to its low price. It’s always nice to have a kitchen faucet that doesn’t break your wallet. Beyond that, you get a product from one of the most reliable German companies in the world. Founded in 1901, Hansgrohe has done a good job of adapting to the many changes in the industry. That is why the Talis M is one of their better offerings in the catalog. Similar to Kohler’s Malleco, the Talis M includes the most sought-after features for general kitchen use. Its familiarity is a strength, and you’ll never feel as though there is something important missing from the feature set. When your only need is a kitchen faucet that does the job without problems (find more kitchen faucet reviews here), then the Talis M will be one of the better choices. As part of large collection of Talis products, this kitchen faucet is one of the better deals out of the catalog. The Talis M has a lot of little features that make the whole of the product an incredible deal. None of these features will blow you away, but together they make a really strong kitchen faucet. The company spent a good amount of time making all of the features balanced. Hansgrohe was smart with their decision making, and it shows with the overall design, function and price of this product. If you want one of the better deals in the industry, then the Talis M will be a welcome surprise. 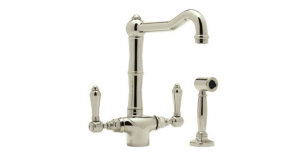 A solid brass body is all you need to ensure that your kitchen faucet stays durable. The Talis M is very good at withstanding damage, dents and high usage in larger kitchens. You’ll never feel like any of the parts are flimsy enough to break from overuse. While putting everything together, buyers will notice that it has a nice weight to all of the parts. The hose in particular is great quality, with more than enough resistance from damage. Unless you drop the parts from high up while installing, you’ll never have to worry about any of the parts failing prematurely. There is nothing that really stands out about the styling of the Talis M. But there is no denying that it has a very pleasing design. Modern kitchens will have no trouble at all fitting this kitchen faucet into their latest styling. This model does a good job of sitting in the background without drawing too much attention. You would think that a low-key style wouldn’t be a powerful feature, but for many consumers it is a priority. The Talis M is a lot more compatible than other products in the same price range when you want to pair it with different kitchen product brands. Everything will flow well together, even if they are from a different set. A strong baseplate can help with many things, including how well the entire faucet holds up over the years. Since the included baseplate is ten inches, it covers the entirety of the baseplate you are replacing- even if it is from a three-set model. This is a big deal for the entire look, and can be considered a must have feature for any kitchen faucet. Optics aside, the baseplate is sturdy and just as durable as the faucet. It looks good once installed, and is resistant to normal wear and tear. The only reason you would ever want to replace it is if you added in an extra dispenser or accessory. The boltic handle lock is the defining feature of the Talis M. Over the years the lever can become overused and loose, making it harder to get the temperature you want. As it ages even more, you will notice that drips and troubles shutting the water off will occur. The Boltic handle lock gets rid of the bulk of these issues and is rated for a multi-year setup. A loose lever will be the last thing on your mind with the Talis M. Paired with the vertical lever starting position, it is a combo that is hard to beat. A strong ceramic cartridge can make or break a kitchen faucet. Thankfully, the Talis M comes through by having one of the most reliable in the business. The leak free operation is rated for thousands of uses, and even in busy households it will be more than enough to keep you set for years. It’s safe to say that the ceramic cartridge of this model is the last thing you should be expecting to break. If you made a list of things that would break on a scale from most likely to less likely, then the ceramic cartridge would be last on the list. This is the most interesting feature of this product, and is not used enough in the industry. Instead of using two levers to balance out water temperature, the Talis M uses a single lever. But they take it a step further by starting it in a vertical position. Now this is where it gets interesting; the further you pull it down, the hotter the water gets. This is to protect you from scalding you with hot water on accident. With a little practice, you’ll know the exact angle needed to get the temperature you want. The vertical lever starting position is a small but nice touch. Does The Spray Button Stay Put? There is a bit of misinformation when it comes to the sprayhead settings for this product. You don’t have to hold the button down to keep the water flowing, but it does revert to stream when you release the button. This may irk some people that like to use the spray function more. It is a mild inconvenience, since it was made more like a switch than an actual locked button. About eighteen inches, which is good enough for even large kitchens. It isn’t super long, but at that length you are above average from what other brands offer. Getting a longer replacement hose isn’t a problem and should be an easy fix for anyone that wants to try it. Unless you have a really large kitchen, the original hose will fit your needs just fine. Are There Any Proprietary Features? Not really. The Talis M isn’t like Kohler that has a never-ending list of proprietary features. Hansgrohe is more about balance in already proven features. So while you’re missing out on some cutting edge stuff, in its place you get features that have long been tested in the industry. These proven features provides new users with a much better experience. New users should be able to adapt to the instructions fairly easy. No matter your experience, the install of this product is one of the easiest installs you will ever attempt. Hansgrohe doesn’t complicate things with their kitchen faucets, so everything will be in layman’s terms. The only complicated thing you will run into is replacing the default hose. And even then, it really isn’t that big of a deal. Customers that usually have trouble installing kitchen faucets had no issues whatsoever with this model. The instructions were a big help in this, but credit should also be given to Hansgrohe’s no nonsense approach to their products. There is nothing complicated about the setup if you understand the basics. You won’t run into any surprises if you do a quick read through before touching any of the parts. Many customers were able to finish the installation in under an hour without calling for help. For a first-time experience with a kitchen faucet, the Talis M consistently scored high among buyers. Splashing is a big deal, especially if your kitchen setup has a lot of electronic appliances nearby. The last thing you would want is water getting on the toaster. Buyers loved that they got much better water flow while still protecting against splashes. Water went where it was supposed to go without having to do anything extra on the consumers end. Even with a limited backsplash area, the Talis M performed admirably in several kitchen setups. This is a proof of their superior design with this model and shows how future models can be improved further. Hansgrohe used the most no-nonsense design possible so that this model wouldn’t stand out. Consumers loved it, even with the limited color options. With only steel optic and chrome to choose from, consumers were still happy with the choices due to the design. It has high compatibility with the majority of setups and doesn’t clash. This was the most important thing for the buyers that praised the look of the Talis M. By sitting in the background and not standing out, it took full advantage of a design decision that is underutilized in the industry. Usually when you hear this it comes from consumers of Moen or Kohler products. In this case, buyers of the Talis M were a little surprised at how solid the entire set felt. Even by company standards, they went out of the way to ensure that this set was one of the best they ever made. Years into ownership, there has been nothing but love for this particular model. Some Talis M buyers have even exclaimed that their kitchen faucet lasted multiple installations. That is the sign of a superior product with industry leading durability. One of the most hated things by consumers is when a brand includes a cheap cover plate. Out of the box, it is flimsy, and really makes the entire kitchen faucet look cheap. That isn’t the case for the Talis M, as it includes a solid stainless-steel cover plate. Consumers were in awe as it was both flexible and durable when installed. A strong cover plate means a better product, and many customers agree on that point. With the Talis M priced in a way to appeal to more consumers, it becomes an incredibly attractive purchase. All kitchen sizes will be pleased with this model, with a strong preference for modern designs since it fits in so well. The biggest competition for the Talis M comes from the competitively priced Kohler Malleco. Kohler specific features really sets the two faucets apart, making it much easier to enjoy up to date features in a budget product. By comparison, the Talis M is a very conservative choice, but that doesn’t mean it still isn’t the better of the two. Hansgrohe is constantly on the minds of consumers because it is such a good value. It is one of those kitchen faucets that is so balanced that it has a high compatibility rate. Hansgrohe is the company that people turn to when they want to get away from the better-known brands like Kohler or Moen. If you take that into account, the Talis M is the perfect answer to all of the products in the same price range. With included high quality parts like the cover base, you’re getting a fantastic overall deal. You’ll never feel like the Talis M was a bad purchase for your home.